Jeremy Corbyn has said that he would “rather get a negotiated deal” than hold another EU referendum. 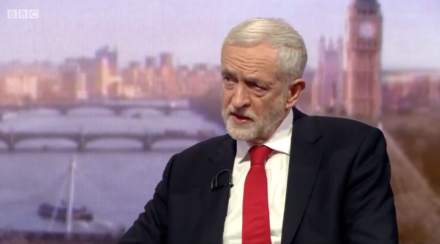 Appearing on The Andrew Marr Show this morning, the opposition leader said that if Labour fails to force a general election, the party is then “into the consideration” of another referendum. Corbyn confirmed that he would not consider supporting the government in the meaningful vote on Tuesday, despite Theresa May’s last-ditch attempts to garner support for her deal from members on the opposition benches. But his preference for a negotiated deal opens up the possibility that Labour could back a softer deal negotiated by May, such as one including permanent customs union membership. Although Corbyn recently described no-deal preparations as “Project Fear” and the leader’s office is understood to believe that the Prime Minister would not countenance no deal, he argued today that a negotiated deal must be approved to avoid leaving the EU without a deal. On #PeoplesVote: If you don’t get a general election, do you then go for a People’s Vote?